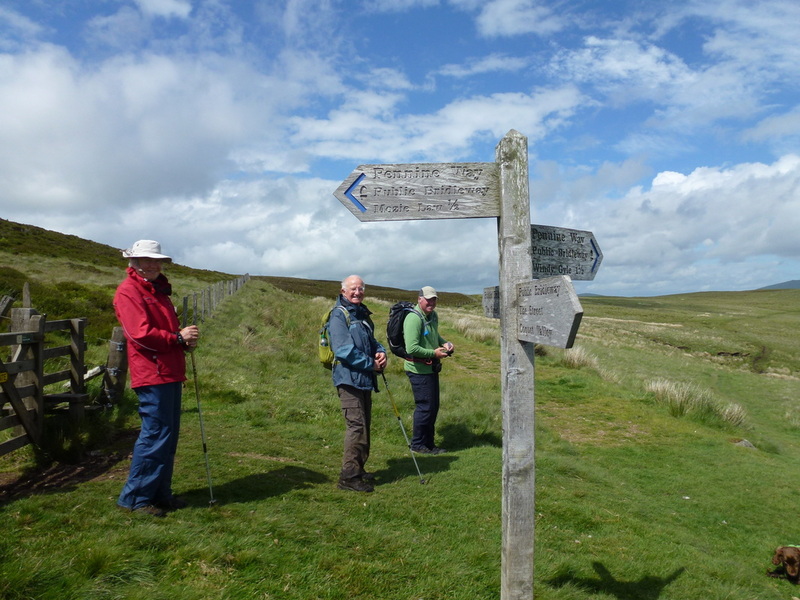 When we were planning our itinerary for the Pennine Way there was much discussion about how we should tackle the section between Byrness & the finish at Kirk Yetholm. 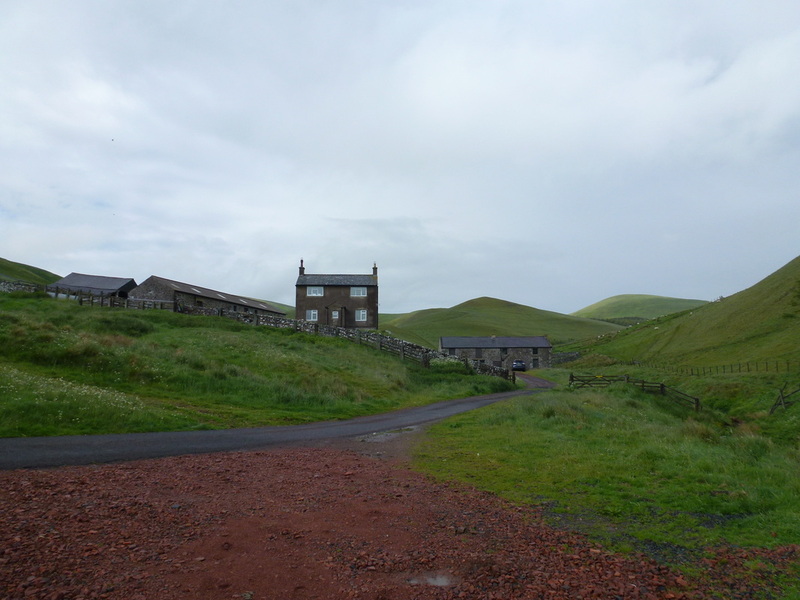 Ordinarily, if camping there are quite a few options involving the 2 refuge huts either side of Windy Gyle at Lamb Hill & Auchope or the Youth Hostel at Mounthooley which is situated at the head of the College Valley due east of The Schil. Or there is the option to go balls out and do it in one go but we both gave up route marching when we left the Armed Forces a few years ago. 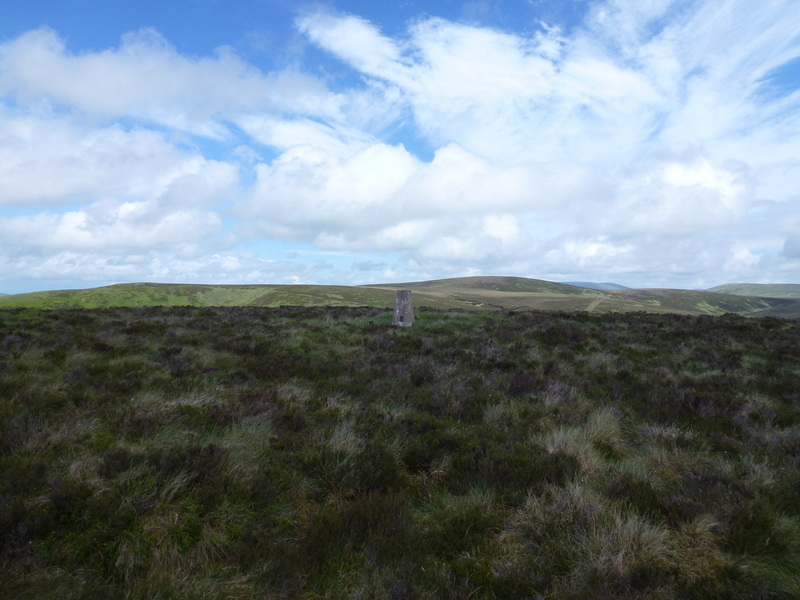 Our preferred method was to take advantage of the last real outpost before Kirk Yetholm and that was Forest View. They do a fantastic value 2-night stay with breakfast & evening meal plus transfer from and to a designated pick up point roughly half way along the route. This enables you to split the mileage into 2 manageable chunks and was therefore a no brainer for us. 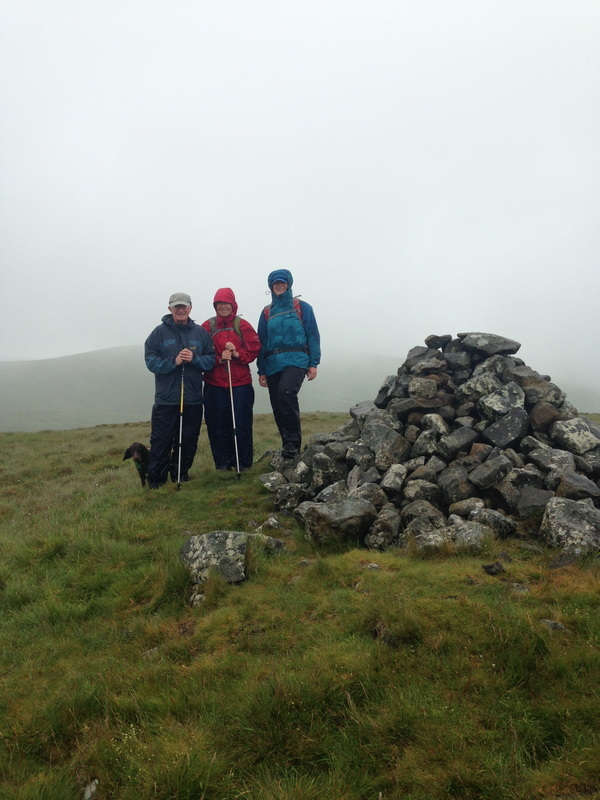 Therefore todays route would take us as far as Russell's Cairn at the summit of Windy Gyle when we would then need to drop about a mile down to Trows Farm where we would be picked up by Joyce and taken back to Forest View. We would also be passing between the borders of Scotland & England several times today; thankfully we didn't need our passports. As for the weather we were destined to have driving rain for the first 4 hours followed by a delightfully sunny spell ending with driving rain again. We reckoned that Joyce & Colin at Forest View must get their fair share of idiots staying with them - before we left they briefed us for a second time about the arrangements for being picked up at Trows Farm and stressed again that we would need to be there at 1700 or risk being abandoned - we got the message and didn't have the heart to tell her we had done much of this route last year and knew the drill. 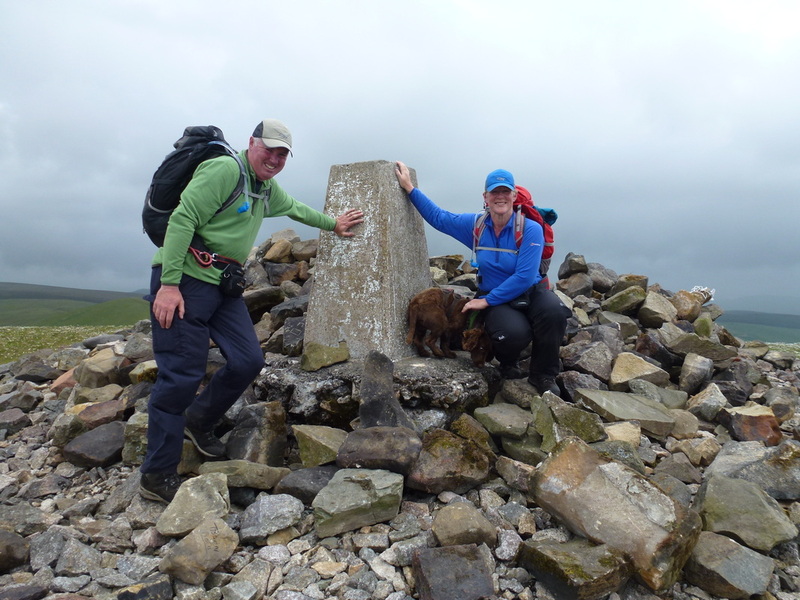 As we were the only people being picked up tonight we decided to stay as a group with Ian & Rosie on todays leg and therefore at 0930 and ensconced in foul weather gear we ventured out into the driving rain to begin our penultimate leg of the Pennine Way. 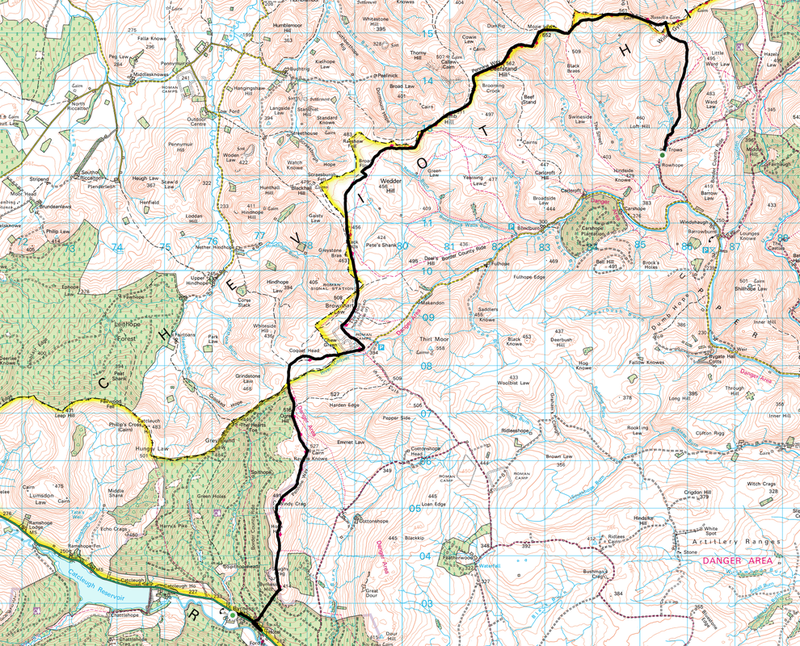 The first part of the walk was along the A68 but as this was a Sunday in the middle of nowhere we were pretty safe. Leaving the road the route was straight into a steep climb for about half a mile to the top of Byrness Hill where we could just about make out Catcluegh Reservoir in the clag. Ahead of us was a path disappearing into another big load of nothing - as far as the eye could see (which wasn't that far to be honest) there were hills and more hills. The rain continued to soak us therefore an executive decision was made by the official group photographer (Angie) to put away the camera for now and just rely on Dave's phone to take pictures. 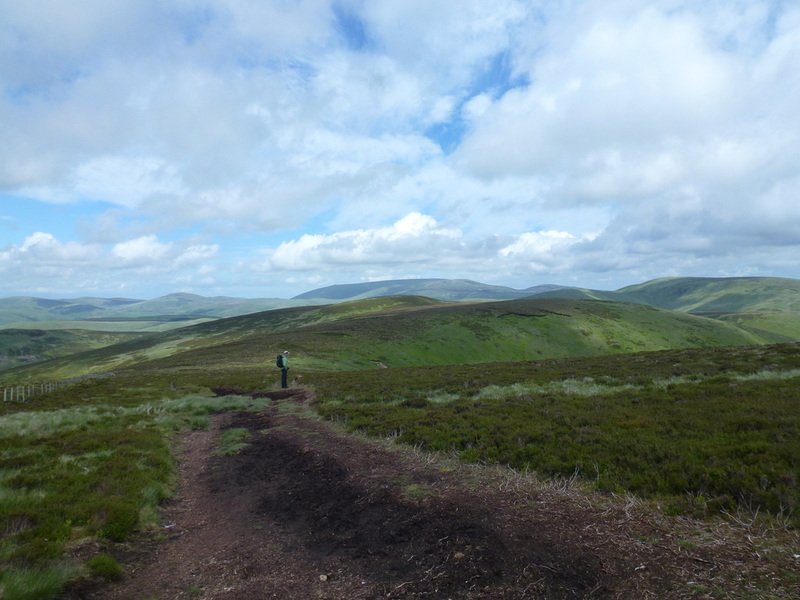 Leaving the large Cairn at Byrness Hill we headed north over an undulating and sometimes boggy path to Ravens Knowe from where the route continued over firstly a section of duckboard then bog to cross into Scotland shortly before arriving at Coquet Head. 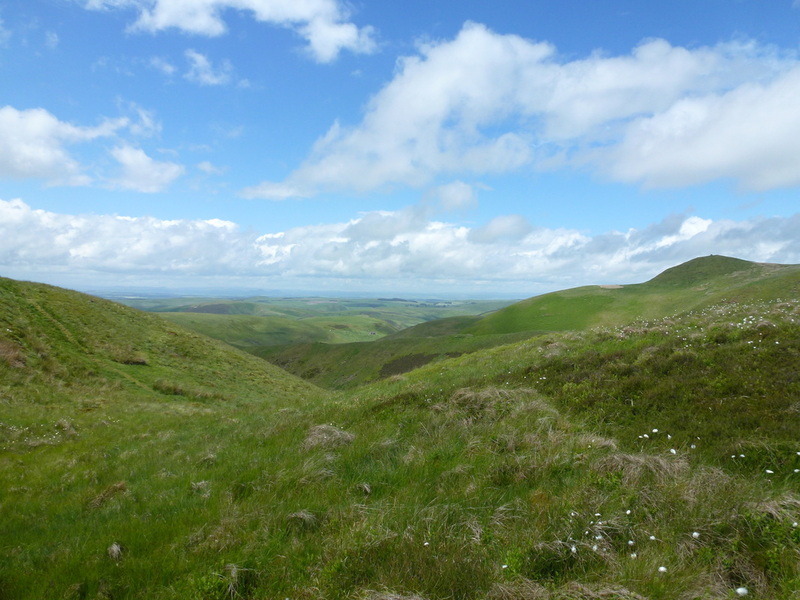 From here the visibility deteriorated as we headed east back over the border to handrail the River Coquet towards the Roman Camp at Chew Green which although we walked right by it we could not see it! 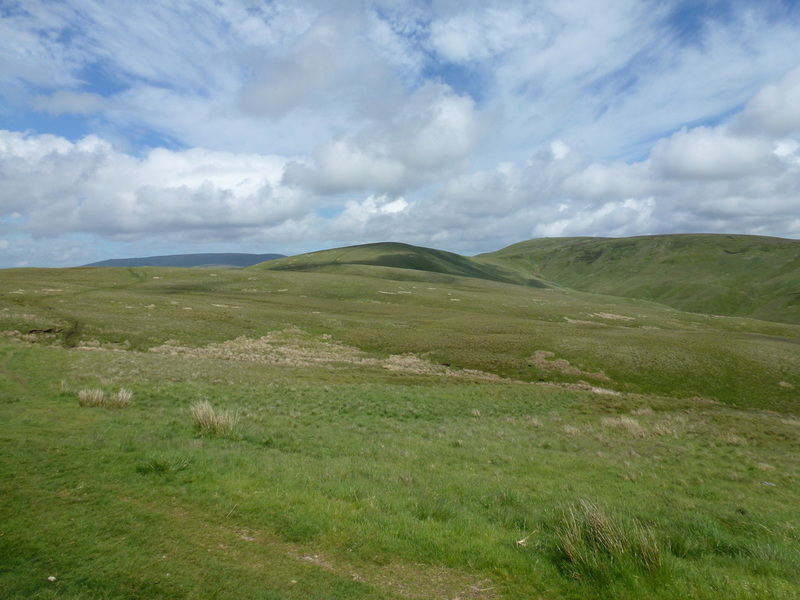 From Chew Green we were now on Dere Street which was the Roman road that linked York with Scotland and we hopped in and out of Scotland once more before continuing on a rising path to leave Dere Street and head north east. We were now heading on a good slabbed path, still in driving rain but morale was high knowing we would get some respite at Yearning Saddle Mountain Refuge Hut which we arrived at some 4 hours after leaving Byrness - at the hut was a Northumberland National Park Ranger who was giving the hut a bit of a tidy and taking all the rubbish down which many kind souls had seen fit to leave up there. 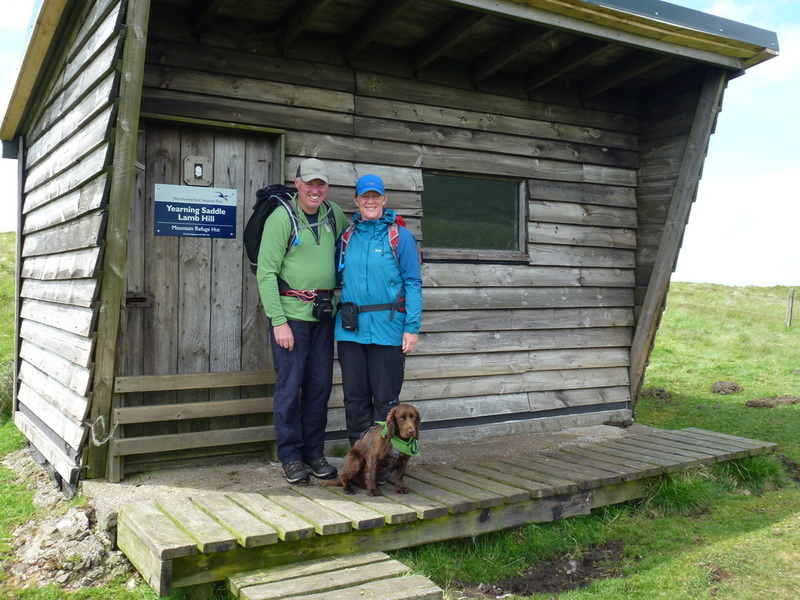 The hut was a welcome sight and allowed us a chance to have a bit of lunch and dry out and what was even more pleasing was that during our break the rain had stopped and the sun had come out. We had a quick peek in the Visitors Book and noticed that Harry and his navigation had made it this far - bless him. Leaving the hut the route now followed the border fence uphill to reach the summit of Lamb Hill before continuing on via another slabbed route to Beefstand Hill - it was really good to have the views back again and they were quite extensive over the beautiful Cheviot Hills. 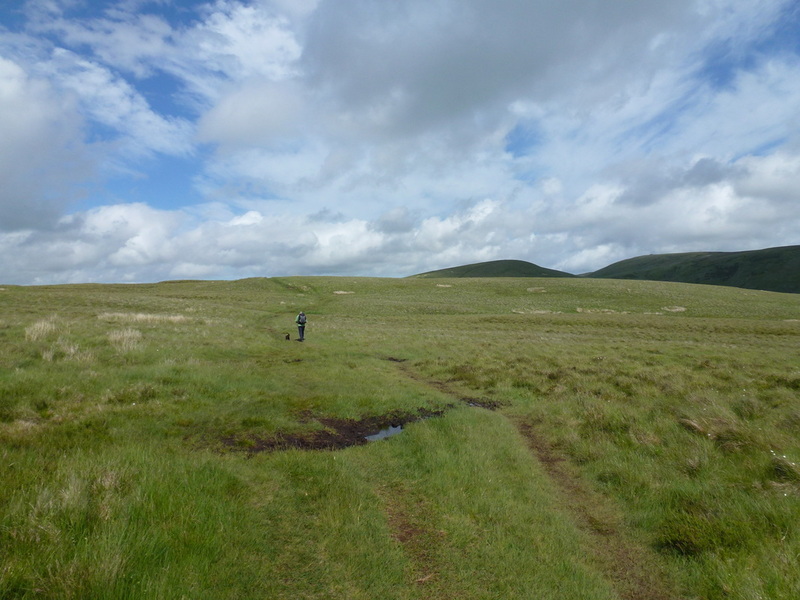 From Beefstand the path heads to the summit of Mozie Law before dropping down to a 4 way fingerpost at the junction of a path called The Street. 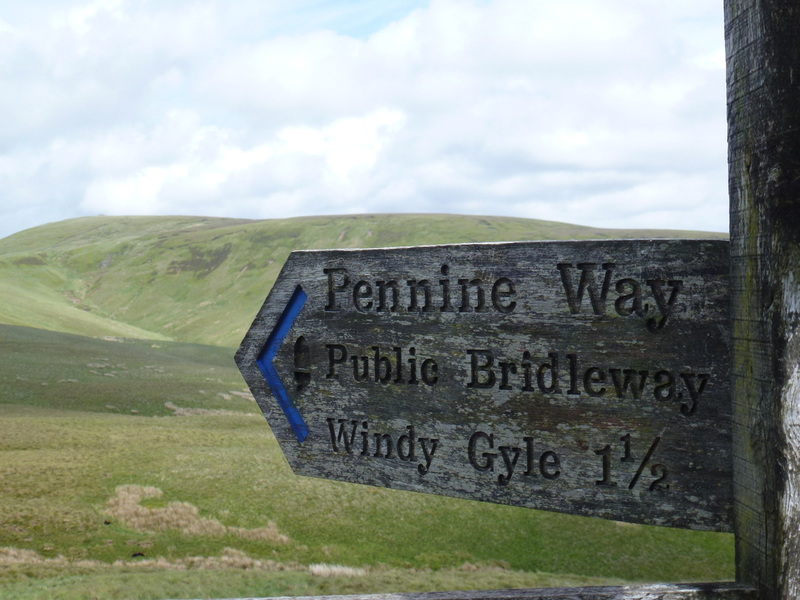 From the fingerpost our goal of Windy Gyle was now in sight and we were well set to make our rendezvous time at Trows Farm with time to spare. 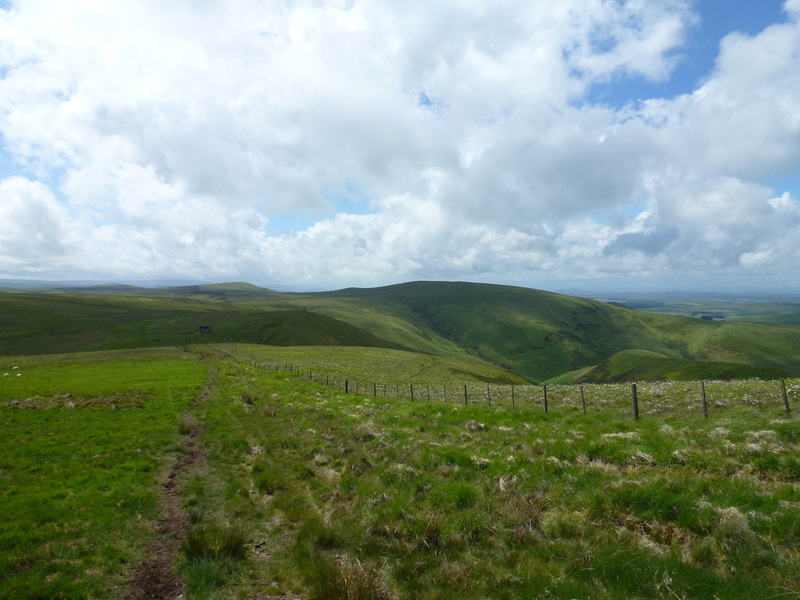 We continued to enjoy fair weather but rain was definitely in the air therefore we glanced often at the incoming squall that was dancing over the hills towards Windy Gyle. 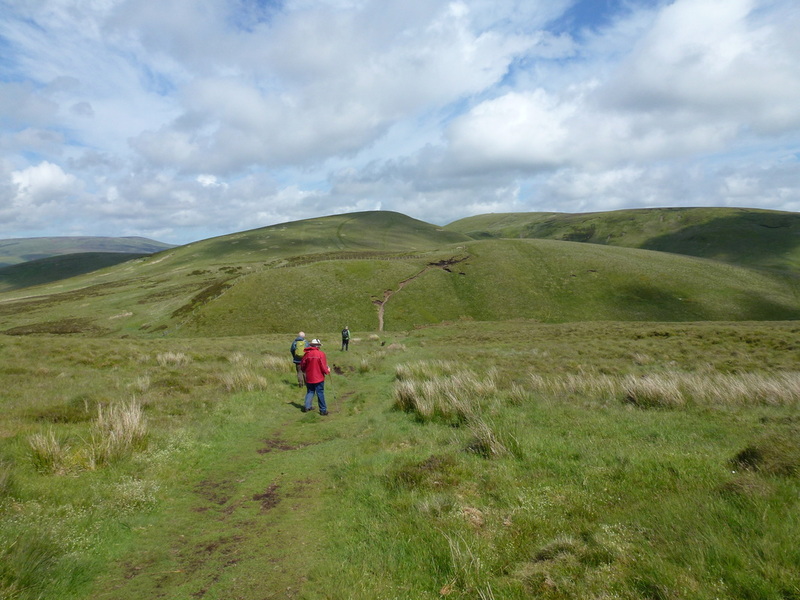 There was a fair bit of up and down to the summit but we were soon at the top and enjoyed far reaching views over our route and also to The Cheviots which we would see more of tomorrow. As expected, just as we started our descent to Trows Farm the heavens opened and we were given a good soaking all the way down. 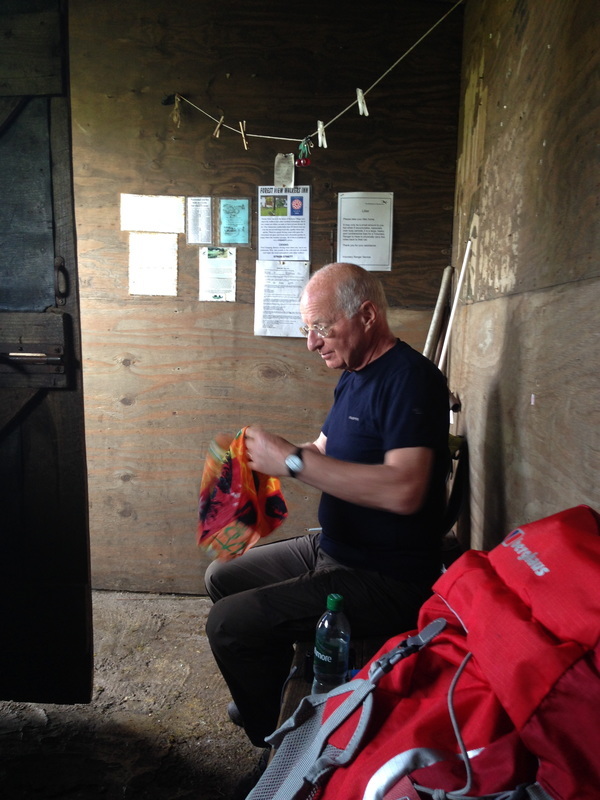 We arrived safely at Trows just as the rain abated at 1630 therefore dried out in the large barn before Joyce arrived bang on 1700 to pick us up in order to make the 50 minute journey back to Byrness. Who hid that depression there?